In total, Il-76 transport aircraft of the Russian Aerospace Forces has delivered more than 40 tons of canned food products, flour, vegetable oil, clothes and medicaments from Serbia to the Hmeymim airbase. 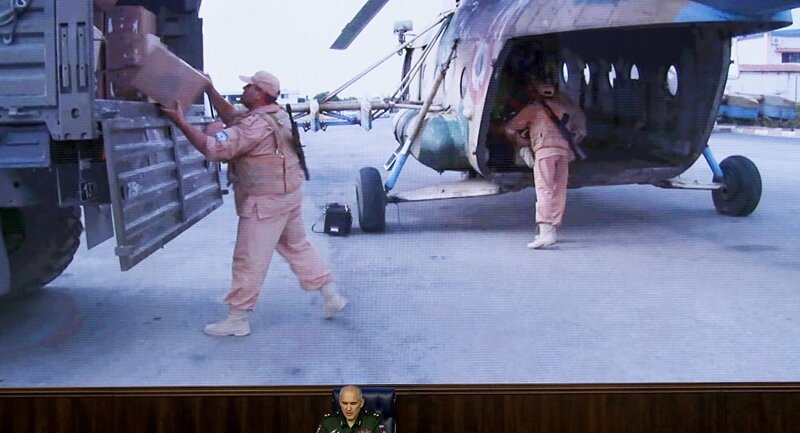 In the nearest future, military servicemen of the Russian Centre for reconciliation of opposing sides will deliver the humanitarian cargos to the most damaged inhabited areas of Syria. Earlier, two transport aircraft of the Russian Aerospace Forces have delivered about 40 tons of vegetables, bakery and sugar from the Republic of Armenia to the Syrian population. Russian Defence Ministry jointly with the Syrian authorities continues humanitarian operation aiding the population of the Aleppo city. The Russian Centre for reconciliation of the opposing sides delivers humanitarian cargoes in Aleppo, humanitarian corridors have been arranged for the civilians and militants, who lay down their arms, cooperation has been organized with the office of the Special Envoy of the UN Secretary General for Syria. The Russian Defence Ministry has supported the initiative of the Special Envoy of the UN Secretary General for Syria Staffan de Mistura concerning the introduction of 48-hour “humanitarian pauses” in combat actions in Aleppo. On August 24, 2016, the meeting of representatives of the Russian Centre for reconciliation of the opposing sides and the head of the UN office in Damascus Steffani Curry will take place in Damascus. The sides will achieve agreements concerning the schedule and the routes for UN humanitarian deliveries for all needy inhabitants of Aleppo. As it is arranged with the Syrian authorities, the first 48-hour “humanitarian pause” in combat actions in Aleppo will be announced after receiving of confirmation from the Special Envoy of the UN Secretary General for Syria Staffan de Mistura concerning the readiness for delivery of humanitarian cargoes to Aleppo. The Russian Defence Ministry jointly with the Syrian authorities is ready to support the delivery of humanitarian aid from different organizations and citizens to Aleppo and distributing it through the deployed humanitarian centres. Mohammad Shakir, a spokesman for Islamic Relief said that recent events within Aleppo will make the work of the humanitarian organizations on the ground much more difficult. The ongoing fighting in the Syrian city of Aleppo complicates the work on the ground for the humanitarian organizations, nevertheless, they will continue to render all possible assistance, leading aid agencies’ spokespersons told Sputnik Thursday. “Recent events within Aleppo will make the work of our teams on the ground much more difficult, but we are committed to continue supporting the victims of this tragedy,” Mohammad Shakir, a spokesman for Islamic Relief that has been supporting victims of the Syrian civil war since 2011, pledged. 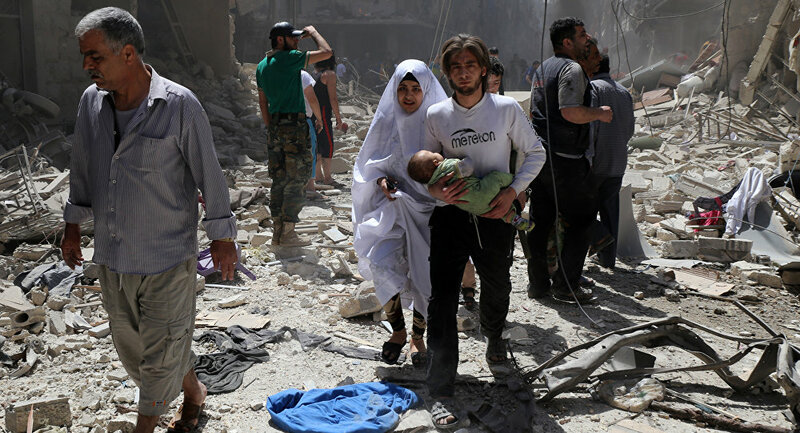 On July 17, eastern districts of Aleppo came under siege by government forces, while fighting in other parts of the city, which is split between government and militant forces, also escalated recently amid the failure of the fragile ceasefire. According to various estimations, up to 300,000 civilians are trapped in Aleppo without access to necessities as the last delivery to reach those stranded was in June. “We will continue to call for all parties to the conflict to respect international humanitarian law and that civilians have a right to self-protection and the protection of civilian infrastructure such as schools, hospitals and energy supplies,” Shakir stressed. Giving people who want to leave Syria’s Aleppo the possibility of doing so through humanitarian corridors is important but it is not a substitute for on-the-ground humanitarian access, a spokeswoman for Mercy Corps, a global humanitarian aid agency, told Sputnik, commenting on the opening in late July of three humanitarian corridors for civilians and one for militants wishing to lay down arms by Russia and Syria. “Any exit corridor must provide for the protection of those who wish to leave and ensure that they are able to freely go where they feel safe. A sustained ceasefire is needed as a first step to ensure their safety,” Christy Delafield added. On Wednesday, EU foreign affairs chief Federica Mogherini and European Commissioner for Humanitarian Aid and Crisis Management Christos Stylianides supported the call for a humanitarian pause in the fighting for Aleppo, originally proposed by the UN Office for the Coordination of Humanitarian Affairs (OCHA). On Thursday, Jan Egeland, adviser to the UN’s special envoy to Syria, echoed these calls.Across Syria, Egeland said, the United Nations has only been able to meet about 40 percent of its aid delivery targets for June and July. The United Nations had hoped to reach 1.2 million people over the last two months. Some 372 civilians including 76 children have left militant-controlled parts of Syria’s Aleppo through humanitarian corridors established by Moscow and Damascus, the Russian Center for Syrian reconciliation said. Nearly 100 militants have surrendered. HMEIMIM Some 372 civilians have left combat zone while 94 militants have surrendered since the start of the humanitarian operation in Syria’s Aleppo city, the commander of the Russian Center for Syrian reconciliation said Wednesday. “At this point, 372 civilians, including 76 children, have left areas in Aleppo controlled by illegal armed groups while 94 militants have surrendered,” Lt. Gen. Sergei Chvarkov said. “We also receive reports indicating that the terrorists are training children and women to carry out suicide attacks,” the general added. At the weekend, Moscow and Damascus commenced a large-scale humanitarian operation in Aleppo, opening escape routes for civilians and for militants wishing to lay down arms.Syria has been mired in civil war since 2011, with government forces loyal to President Bashar Assad fighting numerous opposition factions and extremist groups. Aleppo is partially controlled by Jabhat Fatah al Sham (previously known as the al-Nusra Front), a terrorist group outlawed in Russia and other countries along with Daesh. Forty-eight women with children left the northern Syria’s Aleppo through Russia-negotiated humanitarian corridors, the city administration said on Wednesday. LATAKIA Fighting intensified in the contested city in recent days as militants mounted an offensive to break through government cordons. Some 250,000 civilians are feared to be trapped in the rebel-held eastern districts.An official with the Aleppo administration said people were fleeing through specially-designated corridors under heavy rebel fire. He said militants were using crude homemade weapons. “Their accuracy is very low but in place of munitions they are using gas canisters filled with metal projectiles – nails, screws and bolts. Blasts can be heard every 5-10 minutes in different parts of Aleppo,” the official told journalists. 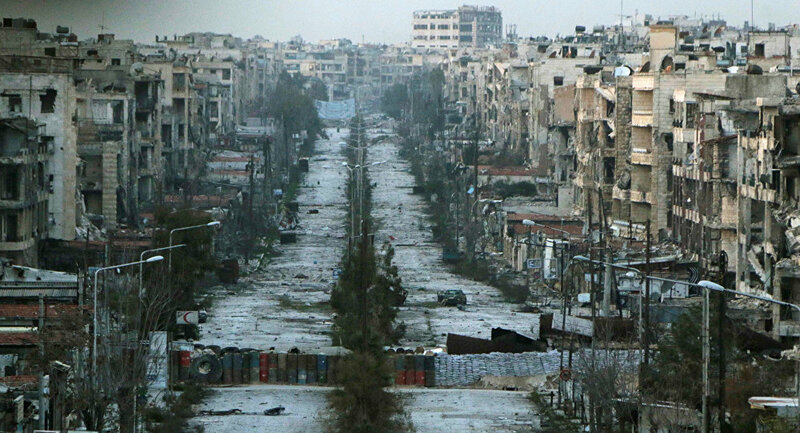 Russian and Syrian military are going to establish four more humanitarian corridors in the besieged city of Aleppo, in addition to three existing corridors that already helped hundreds to reach safety. According to Lieutenant-General Sergey Chvarkov, the head Russian reconciliation center in Syria, four more humanitarian corridors will be established in the Syrian city of Aleppo in the near future by joint efforts of Russian and Syrian military forces. “In addition to the existing corridors, we are organizing four more humanitarian corridors,” the general said. Chvarkov said that the existing three corridors have already helped 169 civilians and 69 militants who chose to lay down arms, to escape the besieged city. “In the areas of those humanitarian corridors we have equipped stations with hot food and medical assistance. The Syrian authorities have prepared six centers of humanitarian assistance, which can accommodate and satisfy needs of more than 3,000 people,” he stressed. Russia has also prepared 14 tons of humanitarian cargo for those fleeing the militants, with 2.5 tons of food and essentials already supplied, he added. According to the civilians who managed to reach safety, living under militants is horrible. “We left with our remaining children. May God punish the rebels. They did not allow us to leave, they deprived us of gas, water, electricity and bread. We were not allowed to leave. There were no medicines. They used to tell us you live with us or die with us,” one of escaped women said. “We suffered and walked a lot, may God curse the rebels. They did not leave food or medicine and by the time we left it was not easy,” another resident added. Russian-Syrian humanitarian operation in Aleppo began on Thursday when three humanitarian corridors were opened in the city.